Hackney Wick wouldn’t be the first port of call for anyone seeking out impressively good dining. It’s still in somewhat of an intermediary stage. Not quite flourishing as flawlessly and fast as neighbouring Stratford is thanks to the Olympic push, yet still retaining it’s bohemian mixed with industrial spirit that it’s been brewing for the past few years. Lots of little cafés, restaurants and art spaces have opened up around the area in the past decade, and Hackney Wick is still treading the line between underground anonymity and Evening Standard-worthy gushing about it being ‘The New…’ something or other. The jury is out on whether that balance will tip one way or the other for us. 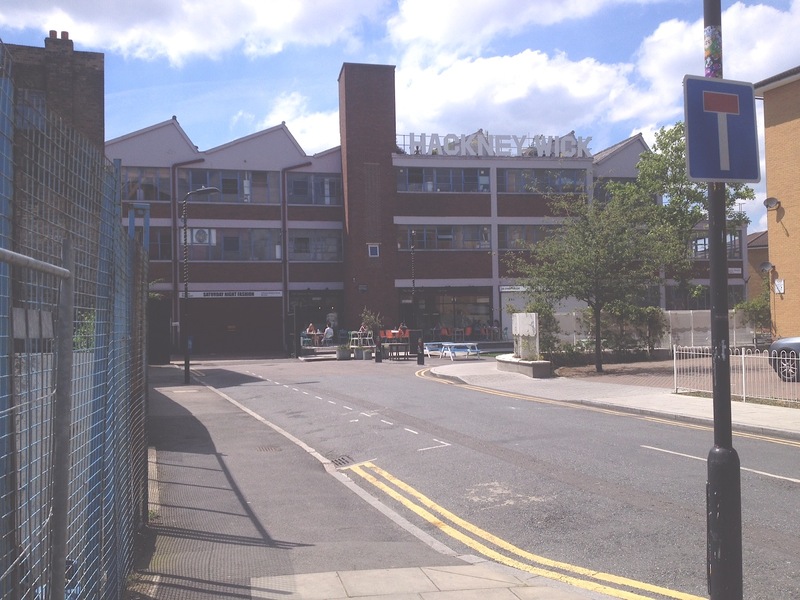 We’ve dined a lot at one of it’s best restaurants, The Hackney Pearl – a restaurant/café that has become one of our beloved beacons of the East and housed many a happy meal during our time so far in London. Here’s what we ate, once for dinner, and another time for brunch…. 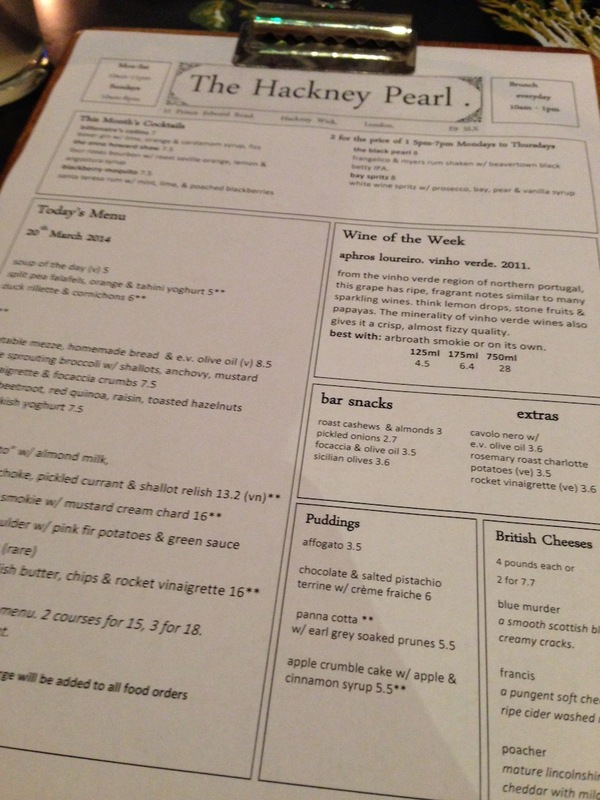 The Hackney Pearl has a real drop-in, slightly hipster but ultra-cool, casual and relaxed atmosphere. It’s multifaceted in that it operates for brunch and lunch as easily as it caters for dinner and drinks, plus patrons are welcome to pop in just for a drink/coffee or just to have a few nibbles and one of the cocktails or beers on offer. It’s transformative with the air of complete ease, and the seating, though not always the most comfortable, is well-spaced and homely, resulting in the dinner and lunch service being constantly busy but without diners feeling like they are rammed in and sitting on top of one another. There’s an array of tables for two, four, or more, and lots of outdoor seating for when the weather is warm. There’s a good choice of wine, beers by the bottle or on tap, and a selection of quirky, well-made cocktails to kick a meal off with. For three of us on a wet March evening, we chose a cocktail each and a locally-brewed beer. It just so happened the cocktails were two for the price of one the evening we landed upon the Pearl, so we naturally had to take advantage. Rude not to! The Billionaire’s Collins was a particular stand-out, with both of us reveling at the cardamom infusion into the gin and orange drink. The Anna Howard Shaw was similarly unique, combining a deep bourbon base with flavours of roasted lemon and clove, and had to be tried as we were enamoured with the name the moment we saw it. Any 30 Rock fans will get appreciate! Patrick: I always like seeing unique starters on menus. All too often you see the same rotating dishes like salad, soup or paté and it’s often unappetising for me as I want to go out and get treated, trying something new wherever possible or something I wouldn’t have the time or patience to cook in my own kitchen. I chose the split pea falafels with tahini to start off with, as you rarely see them on a dinner menu. They were deliciously light, and not oily or greasy from frying, though the orange flavour promised in the menu didn’t quite make it onto my tastebuds. I then had the smokies with creamy chard. The sauce was absolutely out of this world, creamy yet salty, with sweetness from the chard leaching into it and it was luciously lappable – if that’s even a word. Safe to say there was nothing left of it by the end. The huge piece of delicately smoked haddock was a meal in itself and was quite easy to tear away from the bone for a filleting novice like myself. 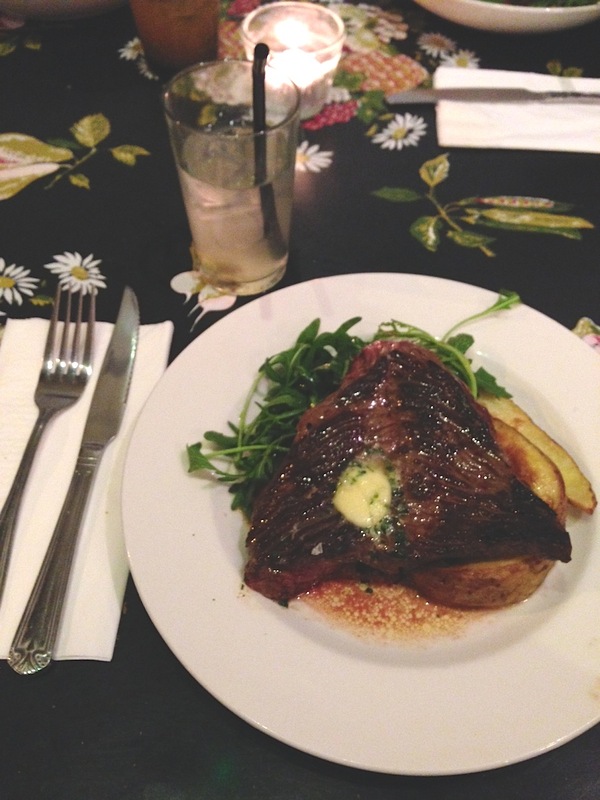 Russell: I had the above Onglet steak which on the menu is stated as being served “rare”. Normally I’d go medium if getting a more mainstream cut, but I had no option here. Onglet is the type of cut that is best served rare (or medium-rare at the most), and one can understand why. 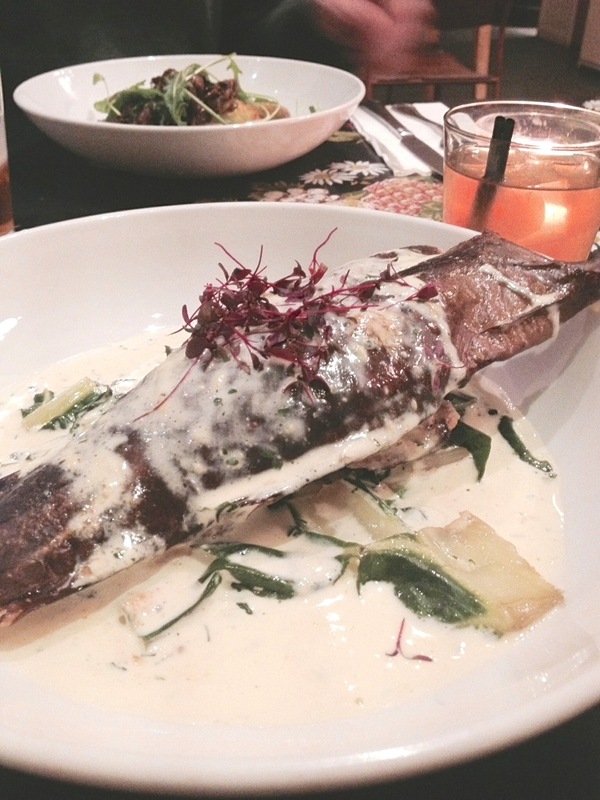 It had a great meaty flavour, caramelised around the outside, with juices swilling into the buttery sauce beneath it. This is exactly how a steak should be. The chips were so homely, still with the skins on and fluffy on the inside. They didn’t feel greasy or overly fried which was perfect. The side of rocket and vingearette finished off the dish perfectly, with a nice bit of tang to mix into the buttery bloody sauce. Before I devoured this, I had the duck rillettes with cornichons. I always love duck and I usually go for a paté so this was right up my street. It was served alongside strips of toasted sourdough which I smothered in this meaty and smooth paste. There were just the right amount of cornichons on the side too, so I could keep nibbling away on while the others finished their starters, seeing as I instantly devoured mine. 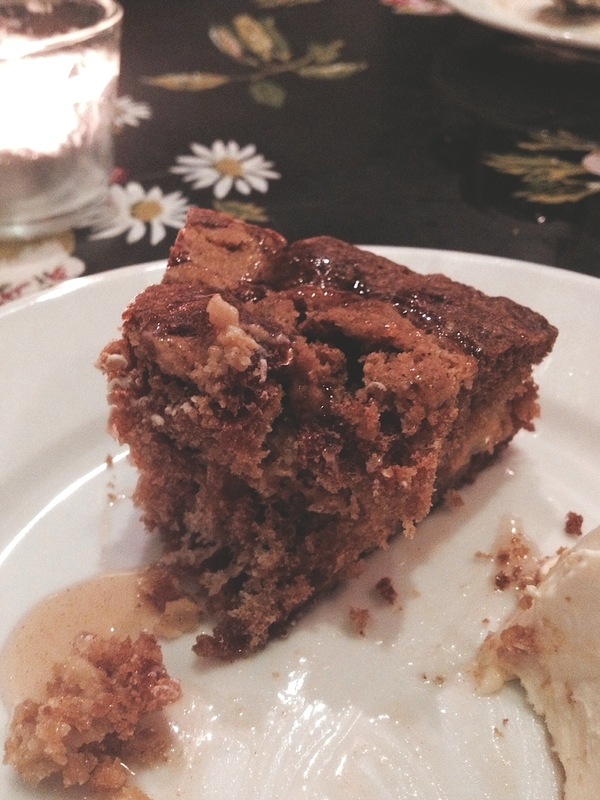 To finish, we had a dessert each, one choosing the vanilla panna cotta with tea-soaked prunes and the other tucking into the apple crumble cake on offer, served with a sticky and sweet cinnamon syrup. What worked for one didn’t work for the other and what the former needed the latter had in abundance, vice versa, yada yada… The crumble cake was nicely fluffy and crumbly with a good apple hum from it, and the drizzled syrup provided a sporadic sweet hit, though crucially this dessert needed some sort of ice-cream or cream or a thin sauce to cut through the heavy texture -as that was the only texture on offer here. 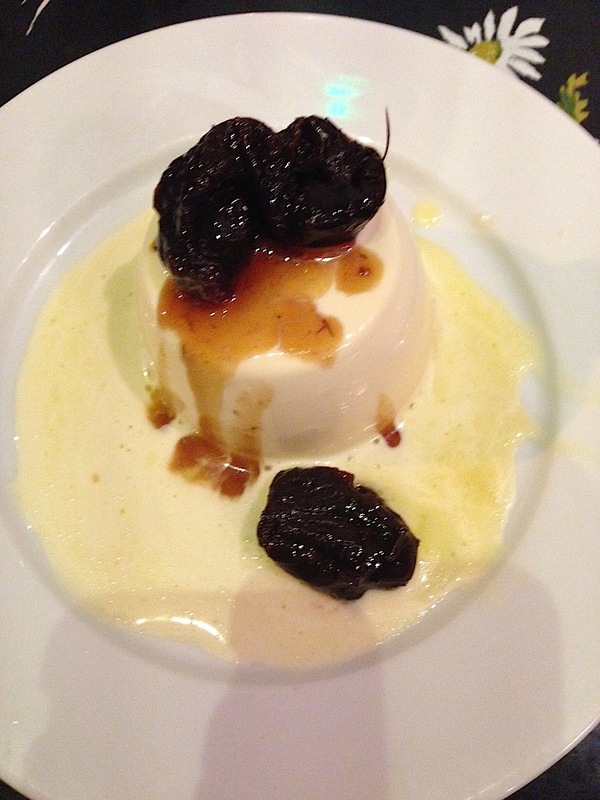 Whereas the panna cotta was nicely made and the prunes were full of flavour, it was almost too rich and didn’t have another interesting texture to help it along. So in the perfect world, some combination of the base elements and flavours of both desserts combined on one plate would have been a winner. Keeping true to our promises of practice, we’ve eaten at The HP a number of other times, including recently for a sunny day brunch. The brunch and lunch offering is always really nice. Warm, homely, slap-up food, but served with a little sophistication and only at a marginal premium. The soup is usually a fantastic choice, and we’ve had it a couple of times during the cold Winter recently, mopped up with thick slices of toasted sourdough. On this occasion we had the lunch special, which gives two diners a choice between two lunch dishes, both at £8 each. Now, we may have misread, misinterpreted or misplaced our brains when we saw that originally, but is it just us or is the wording of the lunch special on their website slightly vague and misleading? We thought we were getting a fantastic deal – two of us can eat lunch for £8? Wow, that’s only £4 each – what a bargain! So we ran there, and ordered both of the special dishes on offer that day, choosing to eat half of each plate, then swap over! The portions were smaller than expected, but nicely filling and washed down with some coffee which made it more of a meal. So still, we were thinking ‘Wow, such a bargain, I can’t believe this’…. until we got our bill and then switched to finding it hard to believe the figure we were given. It was £8 EACH for the plates. Not the ‘two can dine for £8’ type vague offering the website boasts about. And that’s fine, we mis-read and we were happy to pay, as we always are for good food, but if you’re going to splash out on a special you do need to be crystal clear. The aim is to entice people in with saving, and you don’t want to deliver anger and confusion at the end of a thoroughly enjoyable lunch. Perfectly poached eggs are reason to celebrate whenever a plate is landed in front of you, right? 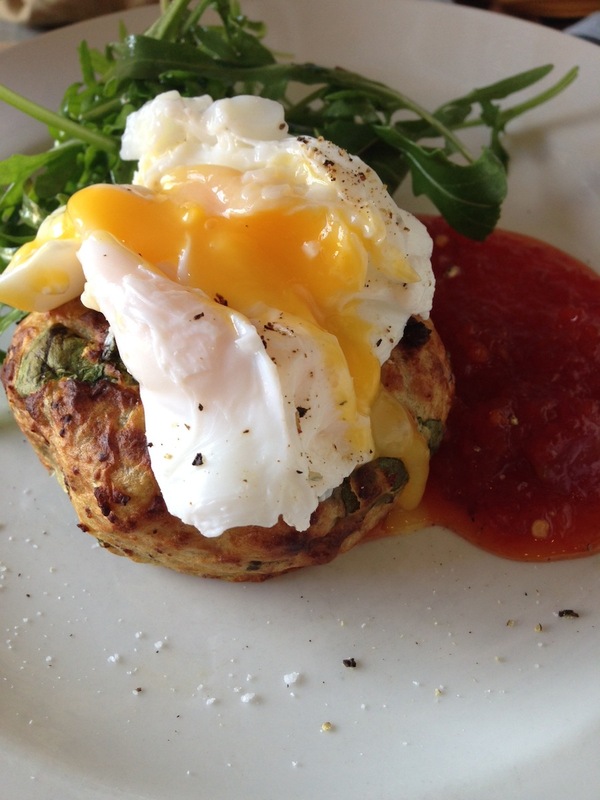 So of course we did with the eggs and potato cakes above, served with a fiery and sweet tomato relish that The HP need to bottle and we will buy a crate of ’cause it was so delicious. 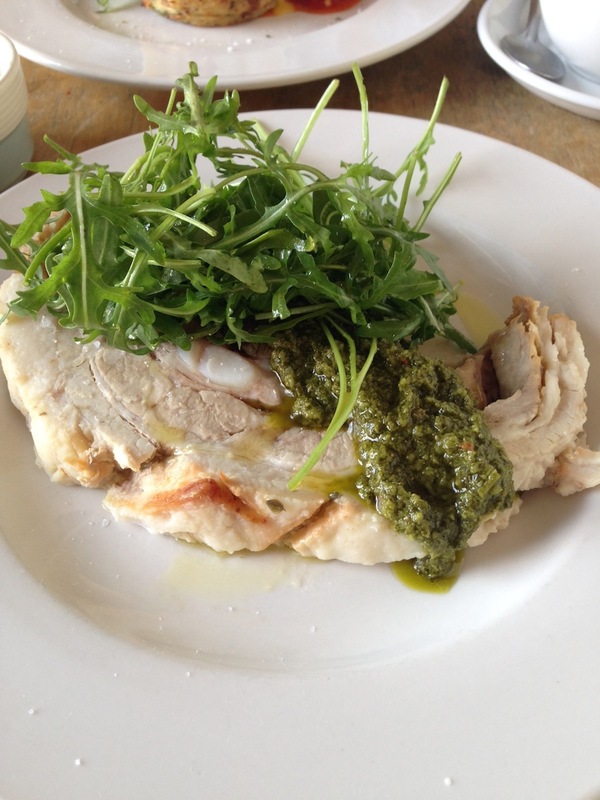 The cold joint of pork served with a chimichurri-type sauce and a fistful of peppery rocket was also belly-filling and spot-hitting, yet light enough for luch. Getting briefly back to the price and size, we feel £8 is a bit much for each plate. So. Verdict time. Wine and dine in the evening, or best bet for brunch? – that’s the conundrum. 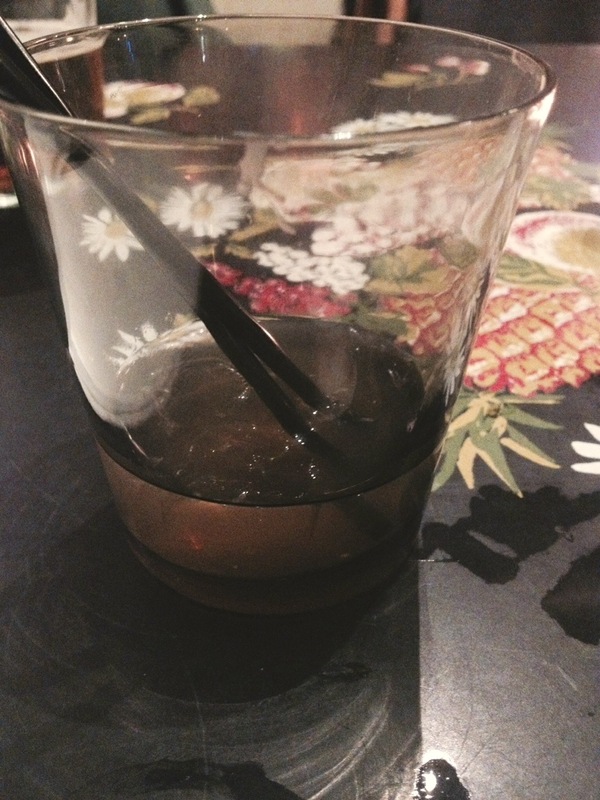 Our verdict has to be: go for dinner and cocktails. Brunch/ lunch is fine and pleasant, but the evening offering at THP is something truly special and whatever magic dust they’ve sprinkled into that menu, the idea, the staff, the setting, they need to bottle and keep topping it up for years to come because it’s just an all-round winner. When three courses are £18 each and you can get two cocktails for the price of one as well, you’re destined for a good dinner before even stepping inside. Each day the menu is reprinted with new items, so no two visits should really be the same. The team pour their passion into the food and the tastes are always fully fresh and seasonal. If you’re in Stratford and looking to eat, yet feel uninspired by the various chains and big-name eateries, do yourself a massive favour and hop on the bus or London overground just one measly stop and knock in to The Hackney Pearl. Likewise if you’re in Hackney or Islington and want a really filling and quirky meal but also in a casual, quiet yet warm and welcome atmosphere you could do far worse than find yourself perched here for the night.